CAMDEN’S Conservatives have already chosen their candidate for the council by-election now upcoming in Gospel Oak, just hours after Labour’s Maeve McCormack announced her resignation. Marx de Morais, who grew up in East Germany, was already down to contest the ward at next year’s boroughwide elections and had begun knocking on doors, but will now get a shot earlier than expected. Tories were joking this evening that there was already an army of Marx-ists ready to do battle, etc etc Badum-tish. The Conservatives are already labelling her seat a ‘target ward’, but that has pros and cons for their agents. Pro: you sound serious about the contest to voters, con: the big talk can look really horrible if you then lose by a distance. 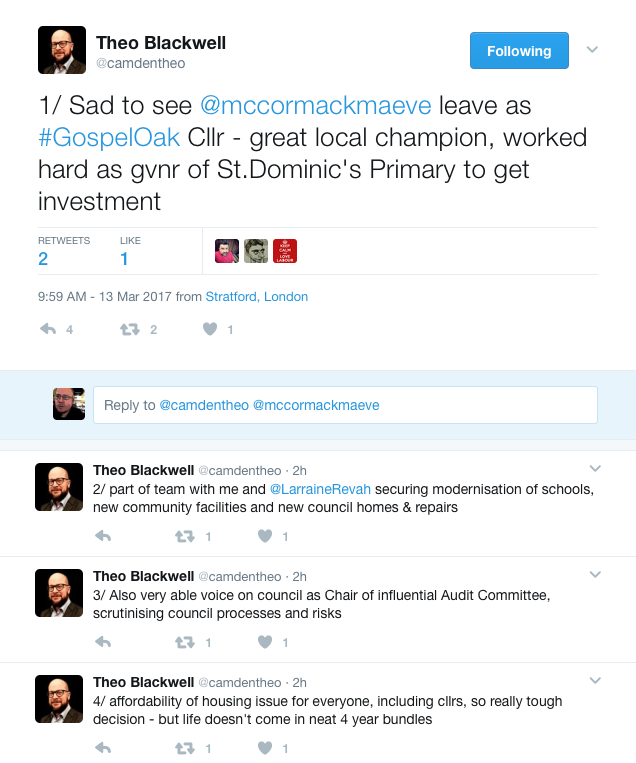 It is after all now more than ten years since Chris Philp and co won Gospel Oak for the Conservatives after long term Labour rule. Now an MP in Croydon, who can forget Chris’s elation on election night, where we found him shouting excitedly into the gym hall air that he could now call himself: ‘Alastair Campbell’s ward councillor’. With Lulu Mitchell and Keith Sedgwick by his side, he made for a big spread photo in the newspapers. But both before and after, the ward has felt like a Labour stronghold. Campbell actually provided the kitchen war table when Maeve won a by-election in 2013 following Sean Birch’s departure and championed the result while appearing on This Week. A year later T-Money was 1,000 votes ahead of his nearest Tory challenger back in the boroughwides. That widely-leaked Baston report from the end of last year also suggests the party has little to worry about here. But Gospel Oak does now become a sort of pre-season friendly, a chance for everybody to make their mark before the main event next year and the first polls test for Labour in Camden since Jeremy Corbyn’s second leadership win, a factor which the Conservatives have said since day one will be a hindrance to Labour candidates rather than a help. In fact, they hope Corbyn equates to the very kind of ‘catastrophic national circumstances’ that Baston guards against in his analysis; the local Labour memberships perhaps think otherwise after nominating Corbyn against Owen Smith in both Hampstead and Kilburn, and Holborn and St Pancras. This guy looks like he should be joining the cast of Made in Chelsea.